I think it’s time for another “Fortunately/Unfortunately” summarizing poem– learned from Sara Holbrook (@saraholbrook) at a wonderful inservice years ago. With many apologies to Sara Holbrook, I will try this again (I did it for a slice a couple of summers ago and then again last March.) First write using the words Fortunately and Unfortunately… Then revise taking out extra words. Here we go! Wow. 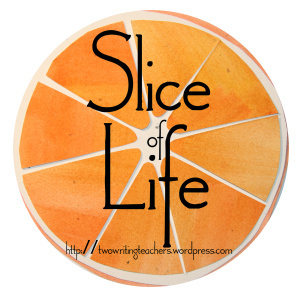 It seems I’m a once a month slicer instead of a once a week slicer. When I drove into the garage, the Christmas tree lights were off and I knew it was time for a Fortunately/Unfortunately. I started loading the dishwasher, grumpy to do the chore once again. Fortunately, the kitchen smelled like apple pie. Fortunately, my youngest son sat and read a chapter book –A chapter book! Later, after dinner, but before the wild ruckus, the scrap pie was served. After school work and playtime, we snuggled in to read a few holiday books. the kitchen smelled like apple pie. youngest son sat, read a chapter book –A chapter book! After dinner, before the wild ruckus, the scrap pie was served.